I can't seem to shake off the habits of my previous career as an architect and property manager, so I do planned maintenance on our bikes. Another term we used at work was preventive maintenance, or even preventative (as some would say). You inspect and replace components according to a planned cycle instead of waiting until you notice expensive damage or suffer major inconvenience. It probably costs more in the case of a bicycle but it means your machines should be ship-shape coming up to a planned cycle tour. It was Mrs Taylor's touring bike's turn for attention a few days ago – up for new tyres it didn't really need, but for once, the wasted expense proved worthwhile. Preparing to remove the front tyre, I unscrewed the valve plunger (or whatever it's called) and pressed it in to release the air. Nothing came out. No hiss. The air came out eventually by squeezing the tyre and waiting. The tube was constricted like a double-kinked hosepipe. It can only be a machine that made this wheel. Anyway, I feel vindicated in my methods. Whether the scrunched up inner tube made the tyre more vulnerable to a puncture, I don't know, but Sandra doesn't hold back going down hills and this it how the tyre has been since new almost two years ago. A front wheel blow-out is the very last thing you want when riding a fully-loaded touring bicycle fast down hill. As well as replacing the tyres and tubes, I replaced the Hollowtech II bottom bracket with an upgrade to Deore XT and fitted a new cassette and chain. The cassette is plain Deore as I've read unfavourable reports about the XT freehub, and the chain is Shimano HG53 like the original. I've replaced the XT freehub on my own bike with a new one just in case. I now tend to replace bike parts myself but for many years I used my local bike shop and they usually told me: "You know... it didn't really need a new one." That might well be true, but all the same I can't help sticking to a life-long philosophy of fix it even if it ain't broke and my wife's kinked inner tube has done nothing to alter my ways. Incidentally, when cycling we drink Vimto out of 'tasteless' Camelbak bottles in which you can leave your drink for a few days without it tasting plasticky. The money saved by less drink wastage can be put towards needless bike repairs. Posted by Patrick on May 1st, 2010. That was a lucky find (the kinked innertube) because indeed it was an accident in the making. I do find all sorts of stuff that needs replacing/repairing when giving my bike a good ol' wash down. I always totally service my bike before any Audax run (even the local perm ones here), or before any trip to the UK. Currently the tourer is sporting a rather large hole in the tyre caused by a lump of windscreen glass getting embedded in it. I know its there, just waiting for a tyre to arrive at LBS, so just short runs on the tourer for now. Only found the hole during a routine maintenance day. I'm a great believer in preventive maintenance. 'An ounce of prevention is worth a ton of cure' my mother used to say! I make a note of the mileage whenever I replace anything so I know how long its likely to last and replace it accordingly. I change my chain every 3000 miles which reduces wear on the cassette and chainrings. I also like to take it back to Roberts once a year so they can change the cables (I'm no great mechanic) and check it over for anything I may have missed. The kinked tube would not blowout. You only get a blowout if the tube blows the tyre off the rim (rare, usually caused by extreme heat on a very steep descent; has happened to me twice), or, the sidewall ruptures. This can usually be prevented. If you examine the beads of the tyres often, you will spot the early signs. If you ever feel a bump bump when you cycle, this is a late warning sign. Can be caused by improperly seated tyre, or a bulge in the tyre. You know that you have a sidewall rupture when you hear an explosion. There is another type of puncture, a hiss hiss hiss type. This is nearly always due to a pinch puncture, or a snakebite as the Americans call them. In these there are two holes present. Preventive maintenance is theoretically of more use than practically. My Dawes Galaxy which died recently of a rear dropout failure, was 13.5 years old and still had its original bottom bracket, untouched and perfect. Every other bit of the bike, other than the handlebars and the seatpin, had been replaced. The life of bike parts is very unpredictable. The preventive maintenance I carry out pertains to chains/sprockets, brake wires which I change about once a year, and tyre inspection. I change these late but if there's any sidewall bulge, immediately. Garry wrote: The kinked tube would not blowout. You're probably right. It's not a pretty sight though. The tyre pressing against the corner of a fold in the tube seems dodgy. Who invented "dodgy"? Good word. Was it Norman Vaughan? In the past I've been guilty of mainly doing reactive maintenance (a term used in one of my previous jobs, I seem to recall). 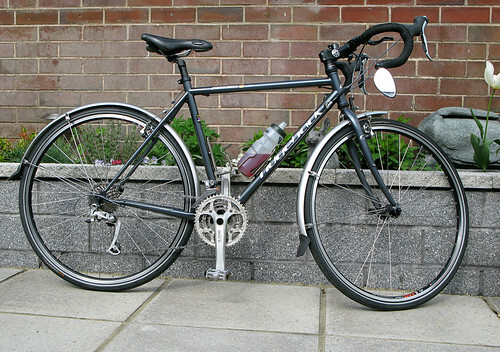 Or I've sometimes just replaced parts when I fancied something a bit jazzier than what was originally on the bike. Either way, I try to upgrade the quality of components I replace. If you have a good frame I think it makes sense. Dodgy is a great word. It goes back to about 1861 according to a dictionary on-line. Dicey was used here and there is a famous Irish song, sung by the Dubliners, called Dicey Riley. It contains the line.. "Poor Old Dicey Riley she has taken to the sup, poor Old Dicey Riley she will never give it up". There was a Denis O'Reilly in my class in school and he was nicknamed Dicey Reilly in its honour!! Iffy is of course another similar word. The concept is translated into Irish as "half-fairly", or of couse "doubtful". Doubtful is probably the the closest word to dodgy in "stiff" English! Garry wrote: It goes back to about 1861 according to a dictionary on-line. I'm not sure that's right. I'd never heard the word dodgy until the English comedian Norman Vaughan used it like: "Oooh! Dodgy!" It would be interesting to know for sure, by finding an instance of it that pre-dates Norman. On dodgy: "The origins of 'dodgy' are suitably arcane... from an 1861 book by Andrew Wyntner with the unlikely title of Our Social Bees: or Pictures of Town and Country Life... 'Beggars divide themselves in several classes: the humorous, the poetical, the sentimental, the dodgey [sic], and the sneaking'." Apparently this extract from the book had nothing to do with bees. From Balderdash & Piffle: one sandwich short of dog's dinner, chapter 5: Dodgy Dealings.